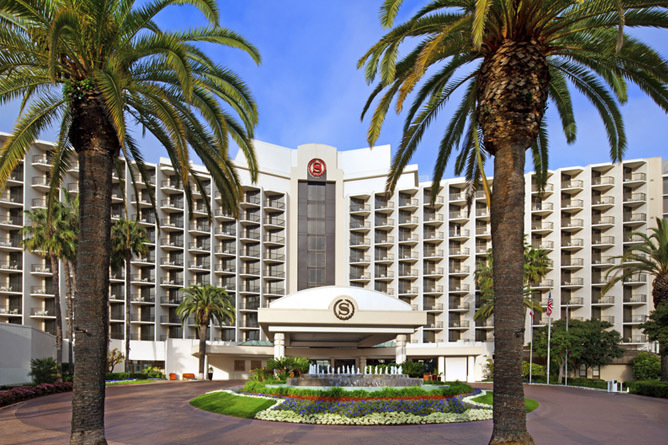 Hilton San Diego Airport/Harbor Island - NOW BOOKING! We have contracted a limited block of rooms at $219/night at the Hilton San Diego Airport/Harbor Island, .8 miles away. To book this hotel, please click here or call Hilton's reservations center directly - that number is (800) 445-8667 and mention code: DATAV. This group rate expires on April 13, or when the room block sells out, whichever comes first. If you have any difficulty booking a room, please call us at +1-310-337-2616 x1 or email us, and we will do our best to help. The Hilton’s Airport Shuttle can drop off attendees at the Sheraton. Attendees under the EDW room block will have access to free internet in their sleeping rooms (normally at $9.95 USD for each 24-hour period). Enjoy complimentary shuttle transportation, which runs between both towers (Marina Tower & Bay Tower) and the airport approximately every 20-25 minutes from 4:45 AM to 12:45 AM. The shuttles are marked with a Sheraton San Diego Hotel & Marina logo. Upon arrival, please feel free to contact them at (619) 291-2900 for an estimated time of arrival for the shuttle. Travel Distance: Approximately 1.0 mile. Complimentary Airport Shuttle: Enjoy complimentary shuttle transportation, which runs between both towers (Marina Tower & Bay Tower) and the airport approximately every 20-25 minutes from 4:45 AM to 12:45 AM. The shuttles are marked with a Sheraton San Diego Hotel & Marina logo. Upon arrival, please feel free to contact them at (619) 291-2900 for an estimated time of arrival for the shuttle. Travel Distance: Approximately 10.0 miles. Travel Distance: Approximately 21.5 miles.